StairSuppliesTM American made Primed Balusters come with a true white prime finish. Because of this, they must be sanded and painted before installation. The 100 wood stair baluster is perfect for contemporary homes and modern stair designs. The simple design and clean lines make this piece versatile. It can be easily trimmed to length and special orders for various sizes are welcome. The spacing of the 100 wood baluster can be varied to provide creative stair patterns. It can be crafted from domestic woods, exotic woods or primed. This option is both affordable and attractive. You get 100 of these balusters for only $18.29? Unfortunately no. “100” is the industry standard part number for a plain 1 1/4″ x 1 1/4″ wood balusters. Sorry for the confusion. so you get one for 18.29? That’s correct. 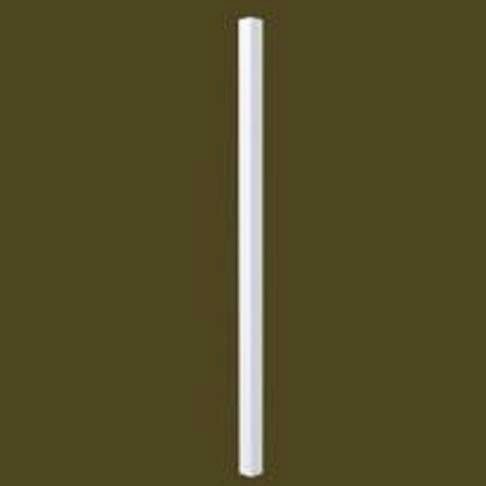 The current price for a 34″ tall American made & primed 100 series baluster is $18.29. Alternatively you could purchase our 100 Imported Primed Baluster, which has the same design & dimensions, but is an imported product. The current price for that baluster is $5.19. Why is there such a significant price difference between American and Imported? We pay American workers a good wage for quality work with quality materials. The imported balusters come from China where the cost of materials & labor is significantly lower. I noticed that the imported version of this product does not come with a dowel pin in the bottom. I want to be sure that this one does. Does it? Thank you for your question, Tawn. This baluster indeed has a dowel pin at one end. Do you have any plain, round balusters with no tapers or ornamentation? Same diameter throughout its length. Thank you for contacting us, John. We do not currently offer what you are describing online, but we are able to address certain custom requests. We would welcome the opportunity to discuss the specific needs and size of your potential order. Please email us at orders@stairsupplies.com so we can receive some additional detail from you. Does this baluster have eased or square edges? Mary, thank you for your question. The edges are square, but they are sanded so the edge might not be completely sharp. If you still need more information about this or any of our products, give us a call at (866) 226 6536, and one of our customer support team members will be able to give you more details.